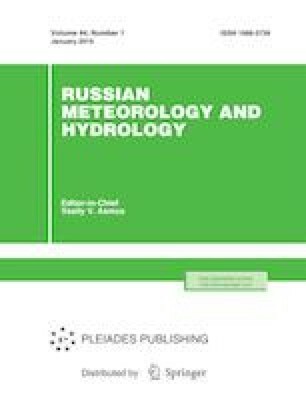 The seasonal evolution of sea ice thickness in the eastern part of the Taganrog Bay is studied using the one-dimensional thermodynamic sea ice model. The numerical experiments are conducted to simulate the thermal evolution of sea ice thickness using various snow parameterization schemes. The results of modeling for the winters of 2007/2008 and 2008/2009 are compared with in situ observations. The quality of the forecast of seasonal variations in sea ice thickness is assessed. Russian Text © D.D. Zav’yalov, T.A. Solomakha, 2019, published in Meteorologiya i Gidrologiya, 2019, No. 1, pp. 67–77.